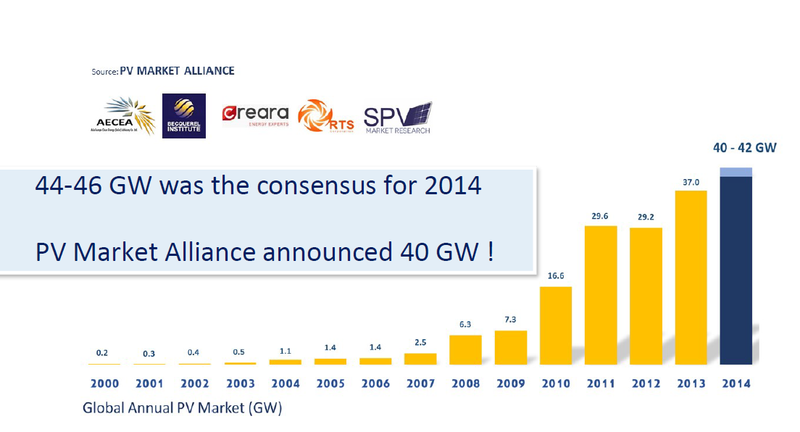 The PV Market Alliance (PVMA) estimates photovoltaic installations of at least 51 GW in 2015, perfectly in line with its last year report forecast, and short of most too optimistic expectations. After 40 GW of PV installations in 2014, a confirmation of PVMA last January early estimate, 2015 experienced a significant growth with a market reaching at least 51 GW, exactly matching last year PVMA central scenario forecast. Strong growth was observed in all major markets while more emerging market started to contribute to the global growth.